Motor racing legend Nigel Mansell owns Woodbury Park (Oaks) Golf Club and has turned it into one of the south west's leading golfing venues just 15 years after opening. The Oaks golf course is the main attraction and looks as though it's been around forever. The golf course is nearly always in top shape, especially the USGA-spec greens which are lightning quick. 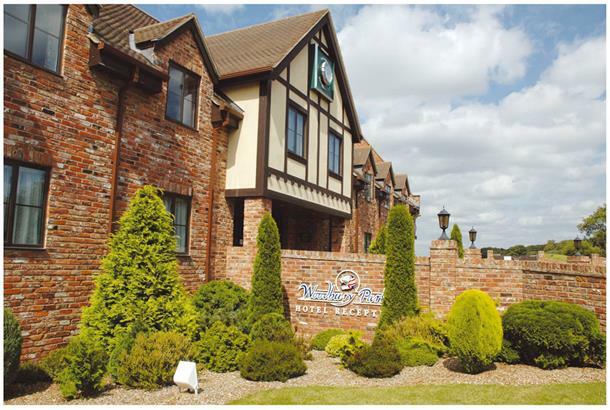 Woodbury Park also offers quality on-site accommodation and leisure facilities. The splendid Woodbury Park (Oaks) Golf Club is set in stunning tree and lake studded parkland, with rolling fairways and USGA spec greens. For the less experienced, the Acorns golf course presents a realistic challenge. You can also brush up your technique on the practice ground and driving range and after your round, relax with a quiet drink or snack in the luxurious clubhouse. It's also well worth taking time out to visit Nigel Mansell's very own World of Racing museum where you can can check out the actual Formula 1 cars he drove to victory and see a plethora of memorabilia from all over the world. Stay & Play: There's four star accommodation on site in the form of 54 rooms as well as five Swiss-style lodges. Green Fees All week: £40. Woodbury Park is the old Nigel Mansell track near Exeter, and racing helmets still adorn many areas. "The golf clubhouse is a separate building to the hotel and gym complex, and you may see many guests of the hotel using the clubhouse as its a popular place to stay. "The golf is covered by a 27-hole complex with a sheltered driving range. "Design wise there are lots of water holes, including the obligatory finishing hole across the lake right in front of the clubhouse for all your mates to cheer you on. "A tricky first with a 90-degree dogleg is well protected by out of bounds either side, and similar to others, requires good tee-shot placements before unleashing the drive. "There are huge greens here with plenty of pin placements. The course doesn't play very long at 6,500 yards from the whites but there are some huge increases if your lucky enough to play the blacks! "Conditions were great for us with some nice sun with occasion showers, and whilst the greens were a little slow on our visit, they were in perfect condition. There is plenty of evidence of work progressing to further improve drainage around the the course. "There are lots of good holes. A few of my favourites are the eighth, stroke index one, which requires a good accurate drive to give you a decent view of the tight entrance to the green, with a pond to cover the short shots. "I also like the 17th, which crosses a valley and places a premium on making the correct decision on the tee as you either attempt to clear the valley through the tight trees, or lay up to the bottom. "Overall a great experience and our society will be back next year.". I played the Acorns course whilst I was in the area on holiday and can honestly say I loved it. I was a bit sceptical about paying £20 for a twice-round nine holer course but it was well worth it. Extremely well kept with some challenging holes and long pars. I can only imagine how good the Oaks Championship must have been like. Went twice it was that enjoyable. I would reccommend it to anyone. Great facilities on site and really modern looking. All in all I would say Woodbury Park is a great course with good facilities. However it is a very commercial course and not a good 'members' club. The club house whilst being a great facility lacks atmosphere and does not provide good service. Not a club that make it easy to meet new people. In summary, A good course (plus the smaller 'Acorns' course. Good Facilities but not a good Members club.